Outsourcing to a Digital Marketing Agency, Is it Good for you? There are 550 million internet users in 2018, making digital platforms most suitable to introduce a brand to a large audience. For businesses, especially startups trying to advertise and market their service or product, digital marketing is the most effective and inexpensive option. Usually, outsourcing digital marketing to an agency is recommended, when an entrepreneur needs to focus and maintain their main business. A digital Marketing agency in simple terms provides various digital marketing services like Search Engine Optimisation, Social Media Marketing, Online Reputation Management, E-mail Marketing, blogging, Moblie Marketing, Content Marketing, web designing and so on. A digital marketing agency has a team of professionals who will solely work on promoting the products of their client companies. Expertise: A digital marketing agency has experts who have specialized in the field of digital marketing. The agency brings together experts such as a content writer, a content marketer, a web designer and a digital marketer to provide digital services to the client company. For an organisation to find and hire such experts will be a time-consuming process. Cost-Effective: Imagine hiring an entire team for digital marketing, sounds expensive? when you hire an entire team solely for marketing, you need to pay each and every professional. A digital marketing agency has an already established team for marketing and the cost of hiring an agency is far more inexpensive. A Smart Investment: When we invest there is no guarantee of getting a return, but investing in a digital marketing agency will be a smart choice because they will be able to reach a larger audience by marketing your products and services digitally. The very job of a digital marketing agency is to come up with effective digital marketing strategies and to implement them accordingly. Therefore, your investment will have great returns. No Need to Train Employees: Suppose you hire an in-house team for digital marketing, you will have to train them so that they meet the needs of your company and again there is no guarantee that they will perform effectively within a short span of time. They will require supervision alongside training. However, in a digital marketing agency, the employees will be trained by the agency itself, to meet the needs of your company. Focus Will be on The Main Business: Running a business is not an easy task, especially for a start up the main focus should be on generating profits and providing goods and services to the customers. Therefore, hiring a digital marketing agent will take away the burden of marketing and the entrepreneur or start-up can focus on their main business. A digital marketing agent will ensure that the marketing is done in continuity. Lack of understanding: You will always know your brand/company better than a digital marketing agency if there are any gaps in communication and any miscommunication chances are the agency may come up with a plan with might not be that beneficial for your brand and your brand image can get diluted due to such mishaps. Lack of direct access: When you hire a digital marketing agency, you cannot always approach them to convey any new requirements or changes in the digital marketing strategy, an in-house team will be accessible and you will have more control over them as compared to an agency. 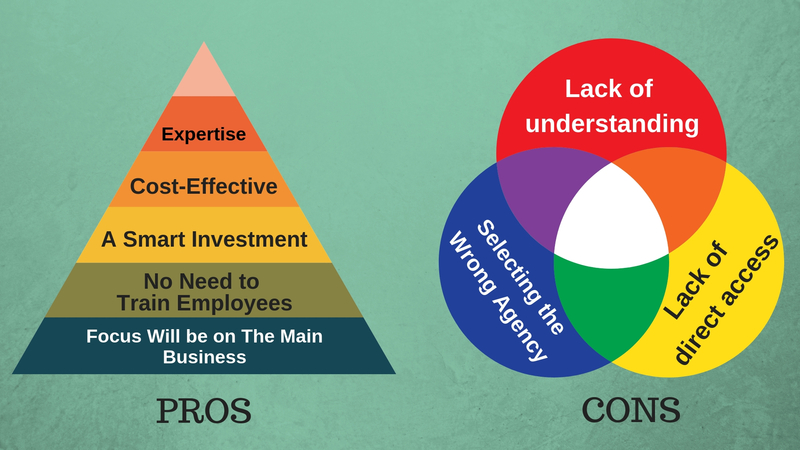 Selecting the Wrong Agency: A wrong agency will lack both the expertise and resources required to meet your needs. It is important to check the profile of an agency before you hire them. Now that we have weighed the pros and cons of outsourcing your digital marketing to an agency, you can clearly arrive at a decision of whether or not hiring a digital marketing agency is good for your business or not.